The latest Miracle Skin International TM formulation of all natural products produced by the cold extraction process . One Physician wrote in to ask if LAM meant "Like a Miracle". Suggested uses for this cream are for temporary relief of arthritis, tendonitis, psoriasis and eczema. Testimonials are pouring in from longtime clients stating that it reduces swelling and soreness, muscle aches and pains and increases circulation in the arms and legs to eliminate cramps. 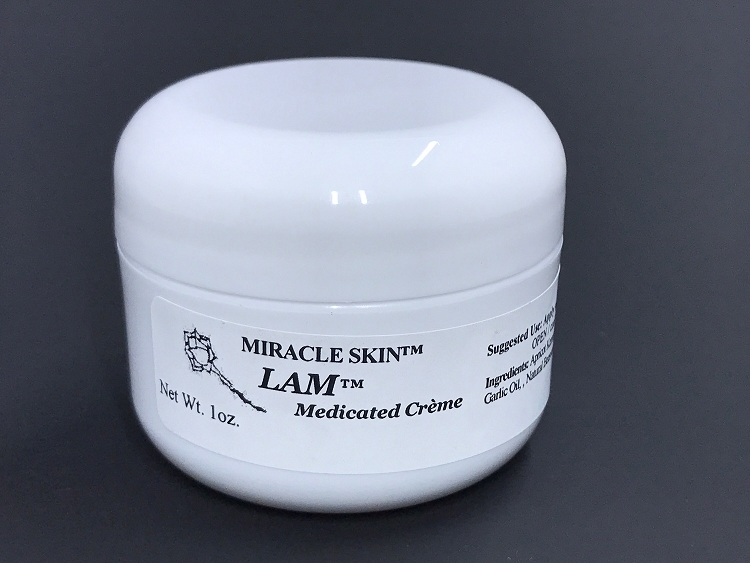 As with all of the Miracle Skin products, our valued customers know from past use of our products that these creams have multiple uses and the results are still coming in! Ingredients: Apricot Kernal Oil, Glycerin, Coconut Oil. Olive Oil, Stearic Acid, Echinacea Purpurea, Melaleuca Alternifolia, d-alpha Tocopheryl (VItamin E) Garlic Oil, Natural Beeswax,Triethanolamine, Glycine, Cystene, Arginine. Brewer's Yeast, Ascorbic Acid.